As November comes to a close, we are starting to have an idea of what teams will look like this season. Here are 10 questions I have for a group heading into this weekend’s action. Can the Badgers end their skid against the Hawkeyes? (Wisconsin @ Iowa, Friday 8 PM EST, Big Ten Network) Wisconsin begins Big Ten play on the last day of November with a trip to Iowa. The Badgers come to Iowa City having lost two straight to the Hawkeyes. In last season’s defeat, the trio of Ethan Happ, Khalil Iverson and the seldom used Charles Thomas made 20-of-35 shots while the rest of the Badgers went 6-of-30 from the field. Can San Francisco continue its hot start in Northern Ireland? (San Francisco vs. Stephen F. Austin, Friday 8 AM EST) The Hall of Fame Belfast Classic will give four mid-majors an opportunity to pick up a pair of quality wins this weekend. While the WCC is often Gonzaga, Saint Mary’s and everyone else, USF is making its presence felt so far this seaon. The Dons are a perfect 5-0 to date and have a chance to pick up quality wins against Stephen F. Austin and potentially Buffalo. 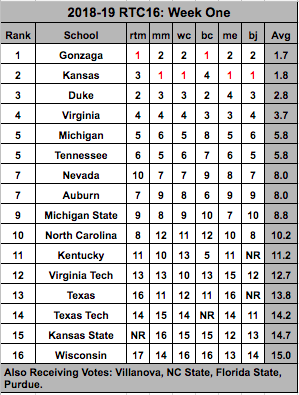 A pair of victories here could further the WCC’s notion of becoming a three-bid league next March. 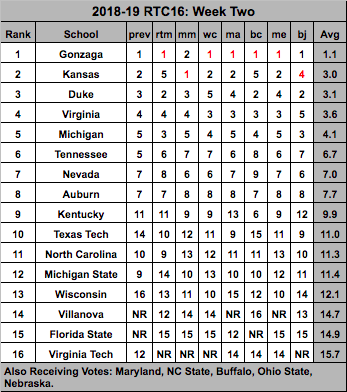 How will Gonzaga fare in its first true road game of the season? (Gonzaga @ Creighton, Saturday 2 PM EST, Fox) Gonzaga hits the road for its first true road game of the year in Omaha against Creighton. The Bulldogs must deal with an elite shooting team in the Bluejays, which have made at least nine three-pointers in every game while Gonzaga has allowed that many only once. 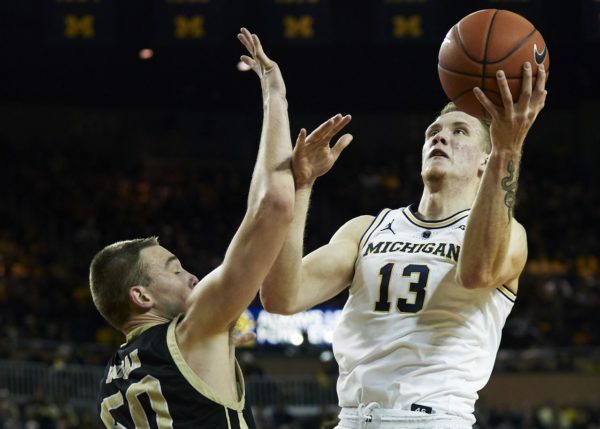 Can Purdue’s offense be effective against Michigan’s elite defense? 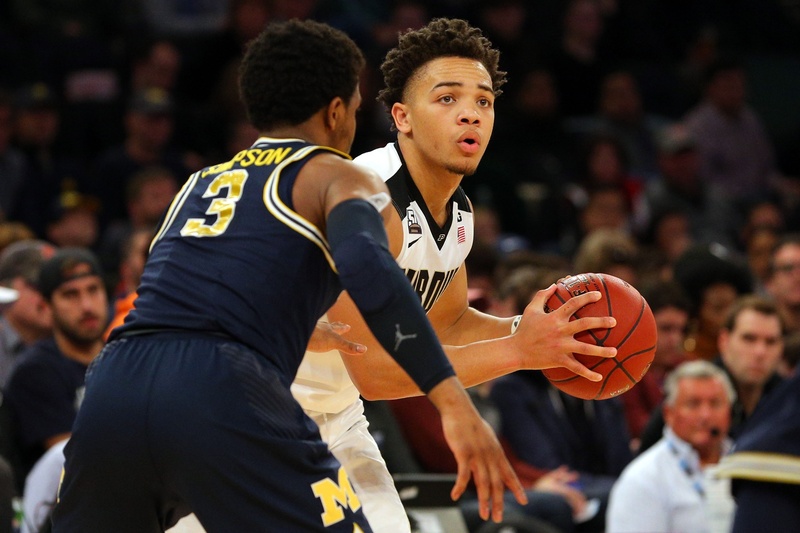 (Purdue @ Michigan, Saturday 3:30 PM, ESPN) In Purdue’s recent two losses, star guard Carsen Edwards committed 14 turnovers while handing out 11 assists. 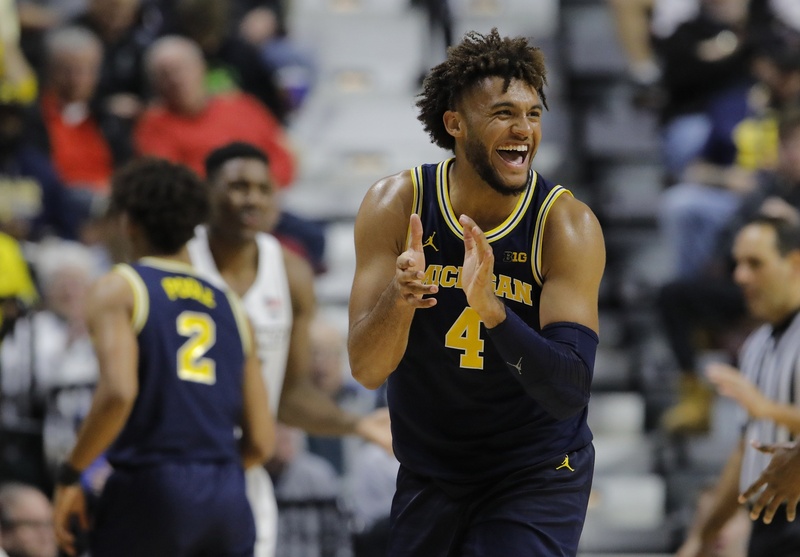 This early blockbuster Big Ten match-up will be interesting as Michigan’s defensive focus is staying in front of its opponent and making every shot difficult — more so than creating turnovers. While this weekend’s schedule is a little light as teams prepare for the nonstop action of Feast Week, here are 10 questions to consider as the season settles in. How will St. John’s fare in its only road non-conference game? (St. John’s at Rutgers, Friday 7 PM EST, BTN) St. John’s only road non-conference game takes place just down the road in New Jersey against local rival Rutgers. In Mustapha Heron‘s first two games as a member of the Red Storm, he is averaging over 20 points per game. Will Arizona State avoid an upset in a potential trap game? (ed. note: this game was canceled last night because of smoke issues related to wildfires) (Arizona State @ San Francisco, Friday 10 PM EST, Pac-12 Network) Before Arizona State heads to Las Vegas to take on a ranked Mississippi State team, they will take on the Dons in San Francisco. After falling behind by 15 points early, San Francisco was only outscored by three points in the final 30 minutes of last season’s match-up in the desert. Has Stanford found Reid Travis 2.0 in KZ Okpala? (Wofford at Stanford, Friday 10 PM EST, Pac-12 Network) When Reid Travis decided to transfer to Kentucky, Stanford had to fill a large gap in its offense. Sophomore KZ Okpala has seen his scoring average explode from 10.0 as a freshman to 22.7 PPG through the first three games of the season. Will early season turnover woes be the deciding factor? (South Carolina vs. Providence, Saturday 2:30 PM EST, ESPN 3) Through three games South Carolina has committed 44 turnovers while Providence has committed 46 turnovers. Both the Gamecocks and Friars are forcing turnovers at a rate better than the national average, so winning the turnover battle will be crucial in this game. Move over college football, make room for the first weekend of college basketball! Here are 10 questions to consider heading into this weekend’s slate of games from Friday through Sunday. Can Arkansas start another season with a win? (Armed Forces Classic, Arkansas vs. Texas, Friday 7 PM EST, ESPN) The Razorbacks have won 23 consecutive season openers, with their last loss coming against a top-five UMass team coached by none other than John Calipari to start the 1994-95 season. 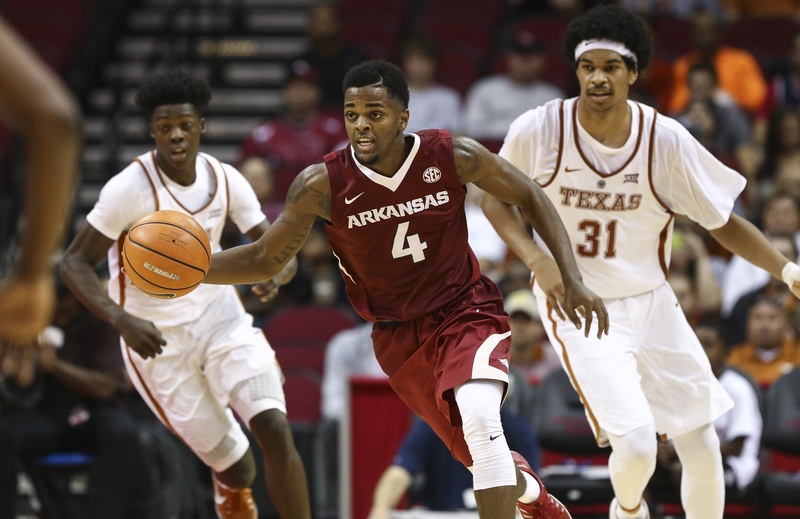 Mike Anderson’s squad will have to find a way to replace the 34.7 points per game left behind by Jaylen Barford and Daryl Macon. After a disappointing 2017-18 season, will the Pac-12 pick up an early impressive road win for the conference resume? (Washington @ Auburn, Friday 9:30 PM EST, SEC Network) In their season-opening win against Western Kentucky, the Huskies shot 29.7 percent in the first half and trailed by nine points before getting it together in the second stanza. Washington will need to avoid a slow start against an Auburn team that shot 18-of-38 beyond the arc in its season opener. How will West Virginia look without Jevon Carter and Daxter Miles? 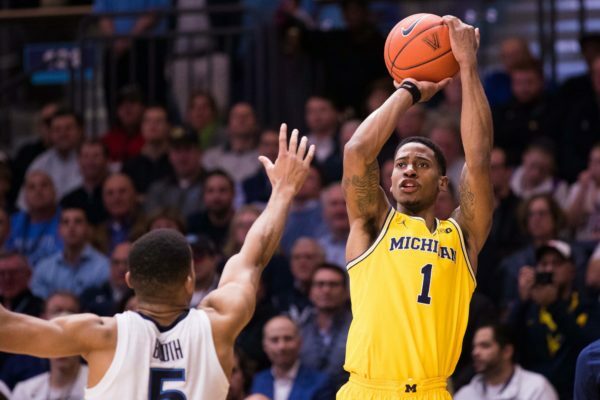 (Buffalo at West Virginia, Friday 9 PM EST, ESPNU) While West Virginia returns a defensive stalwart in the form of shot-blocking machine Sagaba Konate, the Mountaineers will of course no longer have Jevon Carter around to pester opposing ball-handlers. Bob Huggins’ team opens against a Buffalo squad that returns four of five starters from a 26-win squad that took out Arizona in the NCAA Tournament last season. What will Kentucky look like against a team with less talent than Duke? (Southern Illinois @ Kentucky, Friday 7 PM EST, SEC Network) While a 34-point loss is never a good thing, Kentucky can at least take away the offensive successes of Reid Travis (22 points) and Keldon Johnson (23 points) against the Blue Devils. It’s also worth remembering that the Wildcats struggled to put away both Utah Valley and Vermont at Rupp Arena to start last season. #3 – Where Splayed Out Happens.